Curious about a new beauty product on the market or looking to switch up your skincare game? Welcome to our Blogger Beauty Routines series, where our writers take you through their skincare, beauty and haircare regimes and talk favorite products, tips and tricks. These are some new products that have worked for me this Fall! I can say this concealer is definitely a must have for me. This product especially works great for dark circles or redness and lasts all day for me. I used to use Tarte’s shape tape concealer before discovering Too Faced’s concealer; I prefer this one because its consistency is lighter and applies well on my dry/combo skin. 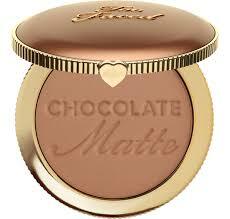 I love this bronzer because it does not show up orangey looking and is great on warmer complexions. This bronzer gives you the perfect natural “glowing from within” looking tan on your checks and cheekbones. One of the best finds I’ve come across this Summer (maybe this year)! Originally, I purchased this blush in “toasted cinammon,” as recommended by beauty Youtuber and influencer, Kathleen Lights. However, I found the shade, “bare peach” works well if you are looking for a deep peachy, pink-ish shade that will still cast a bright and fresh look on your cheeks. This is a great, long wearing mascara, especially in color payoff and volume! Even if you have the teeniest lashes (like myself), this will work great on anyone. I love to pair this particular mascara with the L’Oreal Paris Voluminous lash paradise mascara. Covergirl’s super sizer mascara will give you that extra length on your lashes that you are looking for!